Me and Tim headed out for a session the other evening, neither of us had been out in a while and were unsure as to what conditions we would find when we arrived at our mark. We decided to take a bait rod each in case the water was coloured and not in our favour of using the lures. On arrival there was a decent swell and the water seemed clear from what we could make out but there was a horrible side wind that wasn’t going to make fishing lures easy. We chucked out the bait rods and sat down, Tim was first to go on the lures while I watched the bait rods… He returned shortly after, he wasn’t keen on the cold and the horrid side wind and hadn’t had a touch. We chilled out and watched the bait rods, still not a lot happening and I decided to have a go with the lure rod. It wasn’t easy to fish in the conditions and I was thinking of changing my lure when Tim shouted I had a run on the bait. I scooted across the rocks and it was too late… everyone always says don’t do both at the same time. 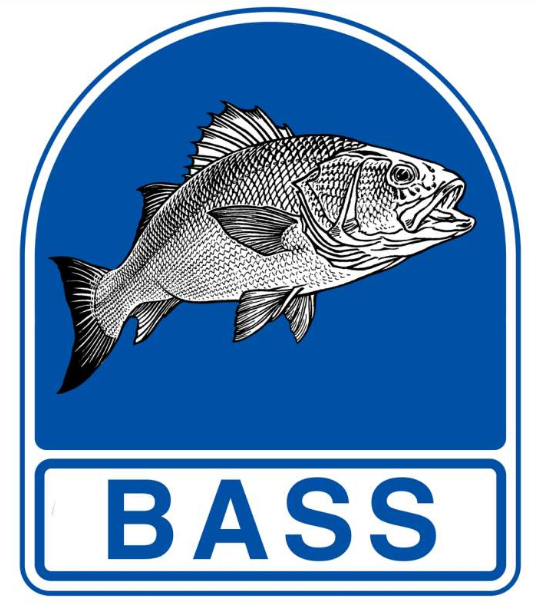 With Bass this has always been the case. I find it’s too easy to miss a Bass bite on bait and from my lure days this has been proven with tentative takes on soft plastics. We carried on bait fishing with a promising sign but I just couldn’t sit still. Watching the bait rods was getting boring although sometimes it is nice just to sit down and relax. I picked up the lure rod and went for another go. I stuck with the same lure a standard 23gm Savage gear Sandeel in real pearl. I cast out and started fishing a straight retrieve with the rod tip down to maximize feel and with the rod pointing in the same direction as the wind. About my third cast in and I felt a solid hit and lifted into a fish. 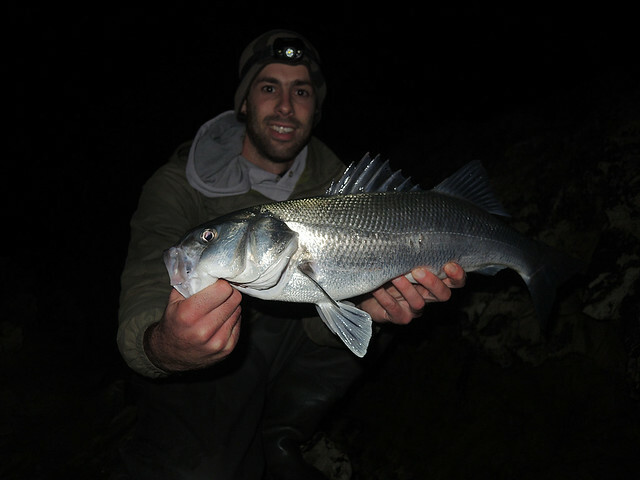 The fish fought well in the swell but I managed to keep it under control and use the swell to get it onto the rocks. 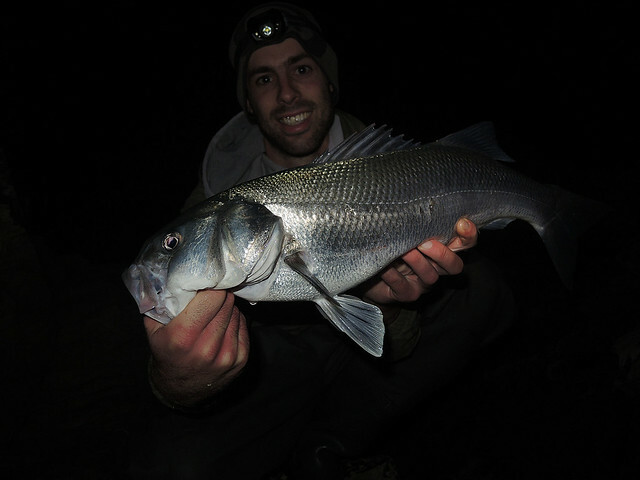 A nice plump looking 48cm fish was the result, I called Tim over and he came and got involved. I landed a 51cm fish next while Tim had a couple of fish around the same size as the first. It was pretty good going from here on and the action only slowed died out. We stuck with what worked and Tim was fishing a sluggo/savagear sandeel soft plastic that he had welded together on a 20gm Jighead. We where fishing over pretty clean ground and into a relatively deep amount of water letting us get away with the heavier jigheads. I dropped a fish that felt better as it shook its head on the surface and slipped the hook. I possibly didn’t feel the bite soon enough in the tough conditions and it was probably lightly hooked. This turned out to be the only one that got away and it is very rare for me to lose any fish at all when fishing soft plastics. Things slowed down but this was turning into a cracking session. Tim moved nearer to me as I was getting more action and I wanted to see him get into the fish. All the fish had been the usual small tap apart from the last one and she hit me pretty hard. There was no missing this one and I instantly new it was a good fish. A good scrap ensued and I took my time trying to make sure that the fish didn’t get her head down at the last minute and take a dive into the rocks below us. 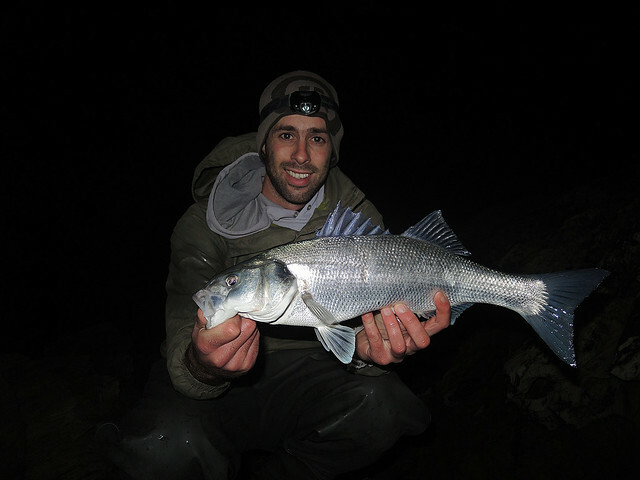 Tim had to land this fish for me and positioned him self in the safest place possible away from the swell. 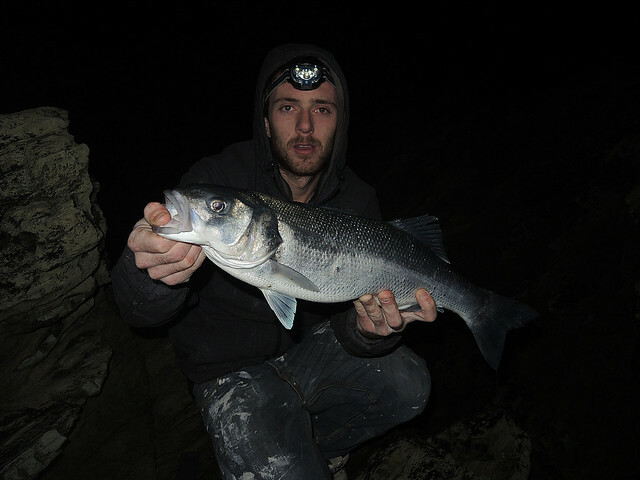 It took a couple times to get her onto the ledge where Tim was using the swell but I was pleased when Tim got the leader and managed to get a good grip of the fish. She was a real brute with a big head, deep body and looked very healthy! She took a while to recover but I was pleased when she gave a kick and swam off under the light of my head torch and back into the deep. It went quiet again after this and Tim moved back onto his normal rock only a five yards away from me but he started to get some knocks but he couldn’t connect. Possibly a bit rusty or more than likely too tired! Finally he connected with a fish that nailed him right under his feet and went for the ledge. He kept it’s head up and gave me a shout. I jumped down and grabbed the fish for him. Time was getting on by now and we decided to call it a night as the bites dried up. 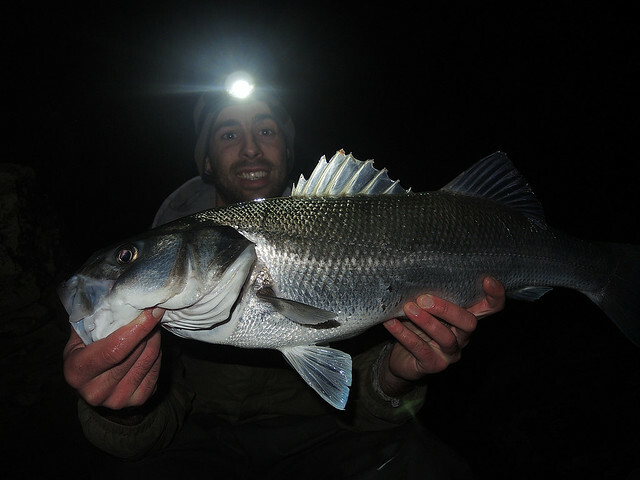 It was a cracking night on the lures and they proved to be more successful than bait on the night. If we had been fishing the bait properly, touch ledgering and fishing them the whole time we ended up lure fishing then i’m sure we probably would have taken a few fish but for me the lures always seem more productive. This entry was posted in The Fishing and tagged Bass, Lure fishing, Savage gear Sandeel. Bookmark the permalink. Nice one Keir. What colour SGs were you using?